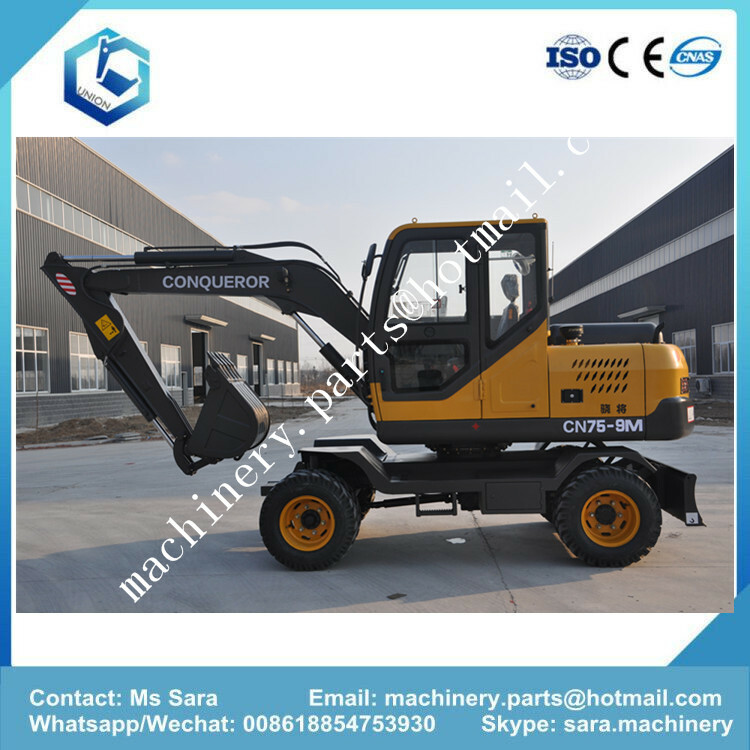 Product categories of Wheel Excavator, we are specialized manufacturers from China, Wheel Excavator, Mini Wheel Excavator suppliers/factory, wholesale high-quality products of 7 Tons Wheel Excavator R & D and manufacturing, we have the perfect after-sales service and technical support. Look forward to your cooperation! We can supply 7 Tons Wheel Excavator, 8 tons Wheel Excavator, 9 tons wheel Excavator, 10 tons wheel excavator. Our wheel excavator main configuration: doosan pump, parker valve, china famous brand engine. 1)Brand engine, low noise, low fuel consumption and low emission. 2)Adopted world class doosan hydraulic system, high efficiency and reliability. 3)Safe and comfortable driving cabin with air conditoner. 4)All structural parts are produced by us for better quality control. 5)ESS power control system is used with multi-power modes to adapt to different operations. 6)Superior excavation performance, design of enhanced structural parts, uses high tensile steel plate.